Make sure to bookmark this page, so you can attempt to do one of these items a day for the next month, or you can wait until you get off tour and have some time off (Heck, or if you’re in some small town where there’s nothing else you can find to do). You’ll get mad points from your lovely accountant (yeah, me!) for doing some of these things. Plus, they should help you take your music career to the next level. You’re important, and so is your future. Start paying yourself for the work you do. After you get your reports, if there are items that don’t look familiar, contact the company to resolve the issue. If you’re quick, you can even ask them to remove it from your credit report completely. A portion of your credit score is based upon how much credit you have available that you aren’t using. Any chance to increase your limit can also improve your scores. Do this and you’ll be saving for retirement, plus there may be tax savings too! This is the only tax deduction you can take even if you didn’t do it before the year was over, do this by April 15 and you can still get the write-off. If you paid anyone more than $600 last year, you may need to send them some tax paperwork. Check this out if you receive form W-9 from a venue or bandmate. Insurance is necessary, but it doesn’t have to be super expensive. Shop around for better insurance premiums for the same or similar coverage. You know what Geico says…15 minutes! Here are 7 types of insurance you should have for your music business. Not only is health insurance required, it’s necessary to protect you in case of medical emergencies. If you don’t have health insurance, there’s a tax penalty for that, in case you’re wondering why you owe more or your refund is lower. Once you’ve got health insurance, use it! Go to the doctor and make sure all is well, and visit the dentist for a cleaning too. We’ll all thank you for it. I’ve seen so many band and artist websites that are out-of-date. Your fans are following you on social media, but your website doesn’t tell them when you’ll be in their city again. Feel free to stop reading and go do this now. If you don’t know where you plan to put your cash, you’ll blow it. Period. Along with budgeting, you should also write out your vision and goals for the year. Then create monthly, weekly, and daily actions that will get you there. How much merch and how many CDs do you have available to sell? Do you need to do a blow out sale to drum up some cash? Maybe you don’t have enough merch & CDs to cover your upcoming tour, and it’s time to order some more. Knowing your inventory count is more than just for tax reasons, it’s good business. You’re tracking your mileage right? Okay, whew! If it’s the beginning of the year write your odometer reading so you have an accurate count and can deduct the most available. If you’re reading this later in the year, start tracking mileage now. Go on out to your car and write down the mileage as of today. Another option: give a quick call to your mechanic to figure out what your mileage was when you took it in for service closest to the end of the year. If you’ve moved, update your address with USPS to have your mail forwarded to your new place. Plus, when you file your tax return use your new address to ensure the IRS has the most recent information. If you have a part-time or full-time job, update your tax withholding. If you owed taxes last year, you’ll want to increase the taxes taken from each check. If you had a huge refund, reduce the amount of taxes. The HR department should be able to help, but your accountant is likely more accurate. Fan engagement is what you want, right? So talk to your fans already! Keeping your music money separate from your personal funds is important. Opening a business bank account (or just a new personal account) used exclusively for your music business shouldn’t take more than 30 minutes. Plus, it will save you hours from piecing together receipts at the end of the year. 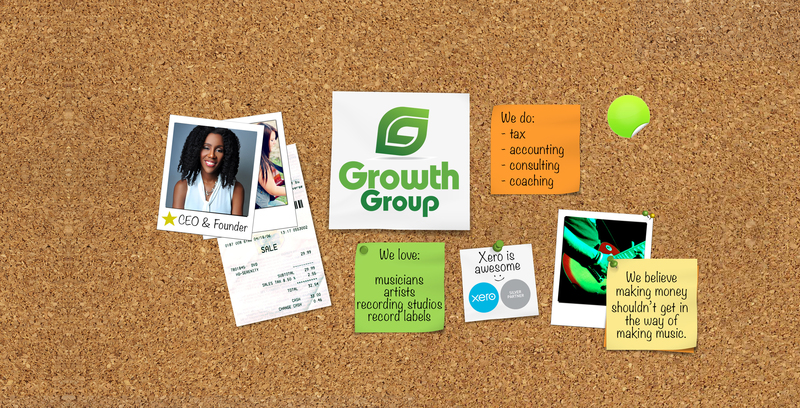 You never know when you’ll need business cards and they should have your most up-to-date contact information. Be sure to include your name, e-mail address, and phone number, not just your social media handles. Recording studios, ensure you add your physical address too. Giveaway a bundle of your new merch, early access to your upcoming album, tickets to your next show, hey get creative. This will be another reason to build your e-mail list (#17). Time, talent, or tangible. Either way works! While I don’t recommend working for free, I fully condone charitable contributions like educational outreach or donating merch & CDs to silent auctions. If you are/were ever employed, you’re “graciously gifted” with something like 13 vacation days. Now that you’re on your own, you still deserve a break. Take the time to schedule a week or two of downtime where there’s no touring, no meetings, and you’re able to relax. Promise yourself not to schedule over it. 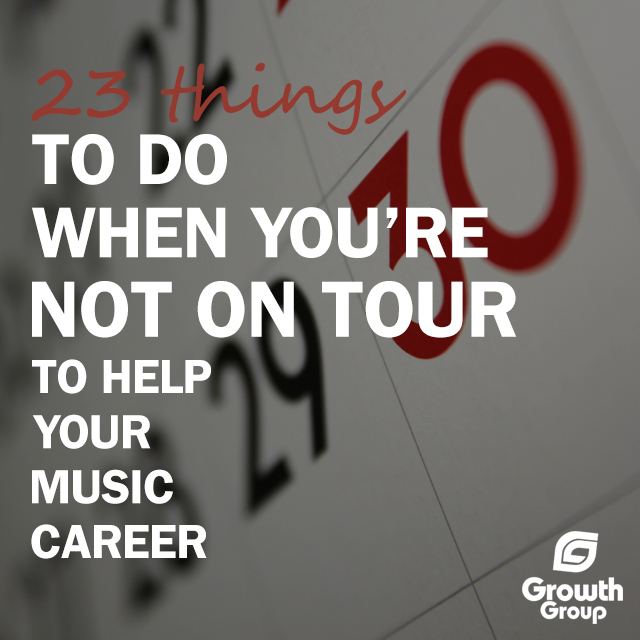 Alright, so I’ve given you 23 options for things to do when you’re not touring. Which one are you going to tackle first? Do you have any others to add to this list? Let me know in the comments below.